After a discussion in another thread I thought I would start a new thread in the aging forum with a technique put up by croweater. Firsty it must be said that there can be no replacing or duplicating years of aging with anything other than years of aging. Lowndsey wrote: Interesting topic. All the info I have read on heat distress aging suggests you need to be careful as the heat pulls out a lot of tannins out of the wood. I've always been tempted to try it as I quite often do the freezer distress thing. Now all this has inspired me to give it a go and I must say I can certainly say I am impressed with what I have done so far. Lowndsey wrote: I gave this heat distress aging a go on some UJSM I had. I had 5 litres of it at 65%. It had been on oak staves for approx 2 weeks. 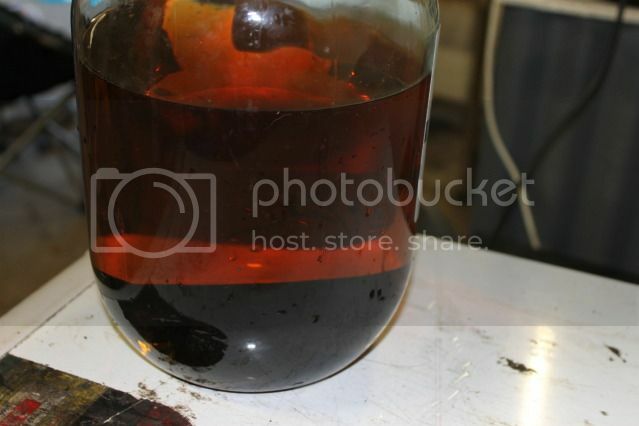 I took off about 1500ml and did this treatment to it in a jar with 2 oak staves about 5 inches long and maybe 1.5cm squared..Only difference being that I didn't add any maple syrup. Just had a taste between the 2 and the diff is night and day. I reckon the distress "aged" stuff has probably "aged" an extra 2 months or so compared to the other stuff. Still not ready to drink for a bourbon but has certainly accelerated the process taste wise and colour wise. I found that it really dragged out a vanilla aroma from the oak. I have been experimenting with a wheatgerm/malted barley hybrid scotch style wash run through a detuned boka. 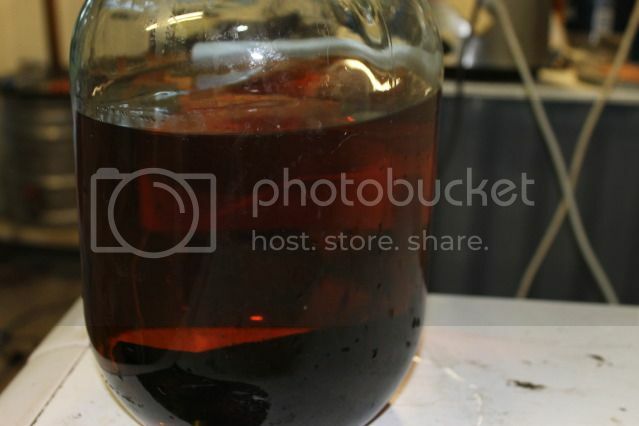 These pictures are of the wash i distilled 2 days ago and were taken 12 hours after heat distressing it. 4 litres at 65%. 4 sticks of 5 inch x 1.5cmx1.5cm oak staves. 2 toasted and 2 charred. The colour is looking amazing after 12 hours with a golden maple colour and again a slight vanilla smell already beginning to appear. It tastes like something I would expect from a 4 or 6 week old oaked spirit. I am quite fascinated with this technique and think it is an awesome way to get a "jumpstart" on your aging before blending and letting it settle in for longer aging. Could also be a useful way to play with different levels of char and oak amounts to get a taste you are after before longer aging. I must thank crow for opening my eyes up to it. Yeah, Crow's saying a mix of oak which has had different levels of use, so that the compounds extracted are more balanced. If they are all 3rd usage, you will just pull excess of some things out of it, and none of other compounds. Gotcha. Anyway it's done now so we will see what happens. The 3 jars 1 with a medium toast 1 with a light char and the third with a heavy char. :handgestures-thumbupleft: tried this out night before last. I didn't have any neutral on oak, and didn't want to go back to essence if I could help it. it was easy and did give a fairly good flavour. im no expert on oak yet, oldest stuff I have is 2 months, and that only a single bottle with 1 charred and toasted domino I've managed not to drink..
in a straight comparison of the 24hr distress oak and the 2 month old, there is a stronger oak flavour, and more rounded?? in the 2 month, as expected. But the 24hr does have a good, smooth flavour with a distinct oak hint. I know that this isn't a long term solution, long slow aging would be best, but in order to get away from essences it seems like a viable short term solution. Doubleuj wrote: :handgestures-thumbupleft: tried this out night before last. I didn't have any neutral on oak, and didn't want to go back to essence if I could help it.